When a tooth has been lost and healthy teeth are located on both sides of the newly missing tooth or teeth, then a fixed bridge is a treatment option. 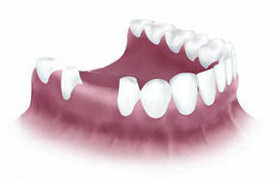 The other options are implants or a partial denture. The procedure for having a fixed bridge made is essentially the same as having a crown made except that a fixed bridge involves at least two supporting teeth. 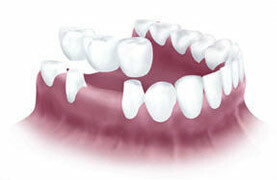 What can cause confusion is the number of teeth needed for a fixed bridge. To replace one missing tooth requires a three tooth bridge. This is because the teeth on both sides of the missing tooth must be part of the bridge to provide support. Fixed bridges are typically made from porcelain with a metal sub-structure and require at least two appointments to complete. 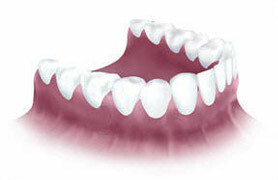 The first appointment is used to prepare and temporize the teeth. The second appointment is the delivery appointment to adjust and cement the fixed bridge in place. Occasionally a third appointment is needed if the span of the bridge is long and the supporting framework for the bridge needs to be tried in before the porcelain is applied to the framework. Even though all of the teeth of the bridge are physically connected, the final result makes it look like the teeth are individual and natural. Please see our Crowns Gallery, which contains some examples of bridges, to see the types of treatment we can provide for you. Implants are an option in some cases. There needs to be sufficient bone for this procedure. If there is not enough bone present, we may be able to add more through grafting. Please read our Implants page and visit our Implants Gallery for more information. An implant may be an alternative to a fixed bridge in some cases. In the case above, one implant is placed. This means the adjacent teeth do not need to be part of the treatment plan. After the implant is placed and the bone around them is allowed to heal, a porcelain tooth is attached to the implant. This stays in the mouth and is only removable by a dental professional if maintenance is necessary.